Bryan Poole is a New Zealand born Botanical & Natural History artist who has been working in the United Kingdom since the early 1980s for a variety of clients in this specialist area. These include The British Homeopathic Journal, The World Wide Fund for Nature (WWF), The Natural History Museum and the McMillan Press Publications for the Royal Horticultural Society. His formal training as a botanical artist stems from his association with The Royal Botanic Gardens at Kew, where he worked under Dr Christopher Grey-Wilson, former editor of The Kew Magazine (which incorporated Curtis Botanical Magazine in 1984), and author of numerous books on botanical and horticultural subjects, in particular the Illustrated Flora of Britain & Northern Europe. 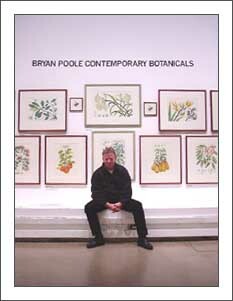 "Bryan Poole follows in a long line of fine botanical illustrators. Unusually, he has the gift to be able to combine traditional methods of illustration and reproduction with a very modern approach to botanical art and design. His appealing and distinctive work adds hugely to the wide range of talent found amongst botanical artists today."